Pumpkin season is officially upon us, which means we’ll be seeing a lot of Jack O’Lanterns, pies, and seasonal drinks like Starbucks’ infamous spiced lattes. Unfortunately, pumpkin season isn’t great for the environment. US consumers purchase and discard so many pumpkins each autumn, they are reportedly contributing to climate change since most are not completely eaten, processed, or composted. It’s a shame, because it’s ridiculously simple to use up all parts of a pumpkin without sending scraps to the landfill. Most people know to cut out and roast the orange flesh for pumpkin pie or pumpkin soup, but it’s less well-known how the guts and seeds can be used to create nutritious and delectable dishes. By using more of the pumpkin, you’ll get more of the good stuff too: these orange beauties are packed with nutrients like Vitamin A, Vitamin E, potassium, and dietary fiber. Here are 6 tasty ways to use the whole pumpkin, stringy guts and all. Fresh, roasted pumpkin seeds hot from the oven are a simple seasonal treat. First, clean out a pumpkin and separate the seeds from the guts. Set aside the guts to use in another recipe, such as pumpkin bread or to combine with the pumpkin flesh for a soup. Rinse the seeds and pat them dry. Sprinkle them on an oiled baking sheet or baking dish and drizzle with olive oil. Roast the seeds in a 325 degree oven for about 20 minutes, stirring occasionally to ensure the seeds don’t stick together or burn. Because the size of pumpkin seeds can vary, keep adding 5 minutes of cooking time until the seeds are evenly toasted a light brown and have become crisp – taste test one to check. Once you remove the pan from the oven, sprinkle the seeds with a generous pinch of flaked sea salt and enjoy. If you aren’t already making your own vegetable stock with food scraps, now is a great time to start. It’s as simple as grabbing a sturdy gallon-sized storage bag and sticking it in your freezer. Every time you prep vegetables, simply toss the stems, roots, and leaves into your stock bag instead of the compost. Great additions include kale stems, onion tops, radish greens, celery leaves, cabbage cores, and slightly mushy or brown vegetables that don’t have mold on them. You can also add pumpkin ends, guts, and the skin, which has plenty of flesh clinging to it. Once your stock bag is full, add it to a pot with about 64 ounces of water and simmer over low heat for about 2 hours. Strain the stock through a wire mesh strainer or through cheesecloth and salt to taste. You can freeze the stock or use it immediately as a base for a delicious vegan or vegetarian soup or stew. Simply compost the boiled scraps you’ve strained out. Craving a delicious, creamy, seasonal breakfast treat? Our recipe for Pumpkin Shakes is just the ticket. To modify this recipe to use the whole pumpkin, simply use fresh pumpkin instead of canned. When you prep the pumpkin flesh for baking, make sure to add the bright orange pulp of the pumpkin, which will also to add moisture. Once the pumpkin is baked soft, puree it and either use immediately or freeze for later use. To modify our Pumpkin Shake recipe, you’ll blend together 1 cup coconut milk (or regular milk), 1 frozen banana, 1 teaspoon vanilla extract, 2 tablespoons honey, and one cup of the pureed pumpkin and pulp. Next time you create a Jack ‘O Lantern or prep a pumpkin to bake, don’t throw away the innards. Separate the pulp from the seeds and set them aside to add to some delectable vegan pumpkin donuts. Rinse the seeds and pat them dry on a towel – you’ll roast them and use them in a sweet-and-savory trail mix perfect for snacks on a crisp fall hike. Preheat your oven to 325 degrees. On a large baking sheet sprayed with oil, sprinkle the raw, clean and paper towel-blotted seeds of one pumpkin. Drizzle with olive oil and a pinch of sea salt flakes. Bake the seeds for about 20 minutes, stirring occasionally. Remove the sheet from the oven and add a selection of trail mix ingredients (mix up the ingredients if you like). Add 1/2 cup of coconut flakes, 1/3 cup of diced candied ginger, 1/2 cup of dried cranberries, and a generous sprinkle of powdered cardamom. Bake for another 12 minutes until toasted and fragrant, stirring occasionally to ensure the coconut flakes don’t get burnt. Allow the trail mix to cool before packing it into jars or bags. If you really want to use the whole pumpkin, there’s no better way than eating a savory vegetarian soup made from fresh pumpkin, served in its own pumpkin shell, and topped with roasted seeds from the very same pumpkin. This fun presentation is perfect for a fall dinner party or celebration, and the pumpkin shell also serves as an impromptu table centerpiece – you could also place it on a platter surrounded by fresh biscuits and rosemary sprigs, or seasonal fruit like grapes and figs. 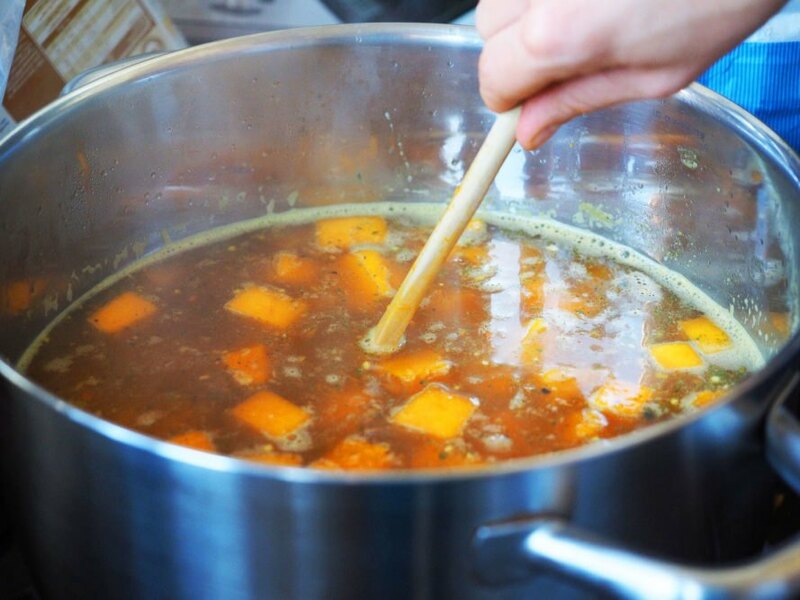 To make your pumpkin soup even tastier, roast the guts along with the flesh and puree it all together for a nutritionally dense dinner treat. Follow our complete tutorial here for details on everything from preparing the pumpkin shell to simmering a simple, savory soup to put inside. At the end of the meal, why not compost the pumpkin skin and shell to complete the cycle? Last but not least, what do you do with the bits of the pumpkin you really aren’t going to use? Even if you make good use of the seeds, the flesh, and the guts, there are some bits that really aren’t edible, such as the stems and the skin. If you toss your pumpkin skin in the trash, it will eventually end up at a landfill where the sheer amount of trash means it won’t decompose properly, contributing to increased greenhouse gases and overfilled trash dumps. Composting the scraps with other organic matter speeds up the decomposition process instead, and well-made compost can be used again to grow and enrich new crops. What if you don’t live in a rural area where you can make your own compost and use it in a garden? No problem – even urban dwellers can create a small compost bin in their kitchens. If you’re worried about odor, follow our tutorial for creating an urban freezer compost bin. Once its full, you can drop it into a city compost bin or community garden, or arrange for pickup by an urban composting company. Pumpkin season is officially upon us, which means we'll be seeing a lot of Jack O'Lanterns, pies, and seasonal drinks like Starbucks' infamous spiced lattes. Unfortunately, pumpkin season isn't great for the environment. US consumers purchase and discard so many pumpkins each autumn, they are reportedly contributing to climate change since most are not completely eaten, processed, or composted. It's a shame, because it's ridiculously simple to use up all parts of a pumpkin without sending scraps to the landfill. Most people know to cut out and roast the orange flesh for pumpkin pie or pumpkin soup, but it's less well-known how the guts and seeds can be used to create nutritious and delectable dishes. By using more of the pumpkin, you'll get more of the good stuff too: these orange beauties are packed with nutrients like Vitamin A, Vitamin E, potassium, and dietary fiber. Here are 6 tasty ways to use the whole pumpkin, stringy guts and all. Fresh, roasted pumpkin seeds hot from the oven are a simple seasonal treat. First, clean out a pumpkin and separate the seeds from the guts. Set aside the guts to use in another recipe, such as pumpkin bread or to combine with the pumpkin flesh for a soup. Rinse the seeds and pat them dry. Sprinkle them on an oiled baking sheet or baking dish and drizzle with olive oil. Roast the seeds in a 325 degree oven for about 20 minutes, stirring occasionally to ensure the seeds don't stick together or burn. Because the size of pumpkin seeds can vary, keep adding 5 minutes of cooking time until the seeds are evenly toasted a light brown and have become crisp - taste test one to check. 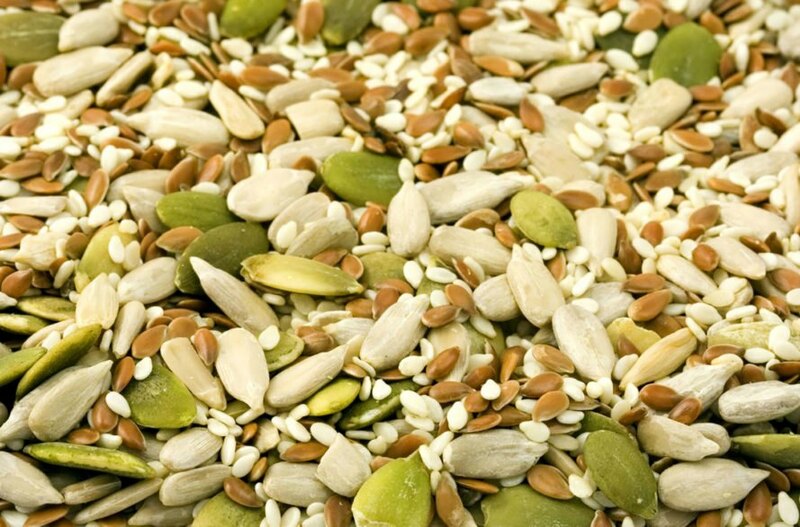 Once you remove the pan from the oven, sprinkle the seeds with a generous pinch of flaked sea salt and enjoy. If you aren't already making your own vegetable stock with food scraps, now is a great time to start. It's as simple as grabbing a sturdy gallon-sized storage bag and sticking it in your freezer. Every time you prep vegetables, simply toss the stems, roots, and leaves into your stock bag instead of the compost. Great additions include kale stems, onion tops, radish greens, celery leaves, cabbage cores, and slightly mushy or brown vegetables that don't have mold on them. You can also add pumpkin ends, guts, and the skin, which has plenty of flesh clinging to it. Once your stock bag is full, add it to a pot with about 64 ounces of water and simmer over low heat for about 2 hours. Strain the stock through a wire mesh strainer or through cheesecloth and salt to taste. You can freeze the stock or use it immediately as a base for a delicious vegan or vegetarian soup or stew. Simply compost the boiled scraps you've strained out. Craving a delicious, creamy, seasonal breakfast treat? Our recipe for Pumpkin Shakes is just the ticket. To modify this recipe to use the whole pumpkin, simply use fresh pumpkin instead of canned. When you prep the pumpkin flesh for baking, make sure to add the bright orange pulp of the pumpkin, which will also to add moisture. Once the pumpkin is baked soft, puree it and either use immediately or freeze for later use. To modify our Pumpkin Shake recipe, you'll blend together 1 cup coconut milk (or regular milk), 1 frozen banana, 1 teaspoon vanilla extract, 2 tablespoons honey, and one cup of the pureed pumpkin and pulp. 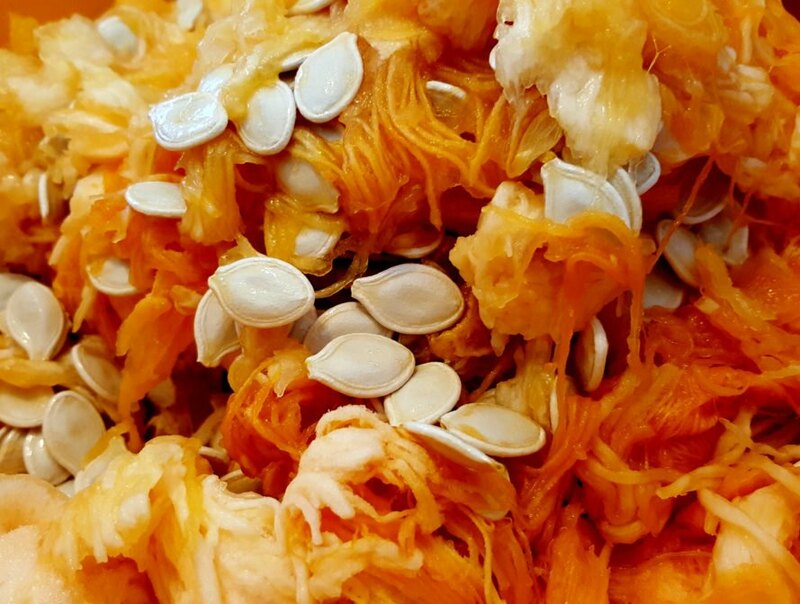 Next time you create a Jack 'O Lantern or prep a pumpkin to bake, don't throw away the innards. Separate the pulp from the seeds and set them aside to add to some delectable vegan pumpkin donuts. Rinse the seeds and pat them dry on a towel - you'll roast them and use them in a sweet-and-savory trail mix perfect for snacks on a crisp fall hike. Preheat your oven to 325 degrees. 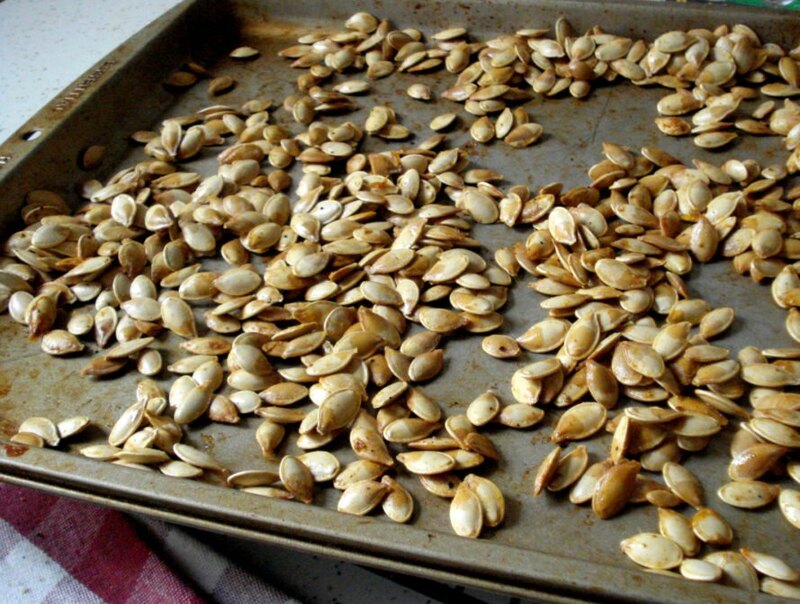 On a large baking sheet sprayed with oil, sprinkle the raw, clean and paper towel-blotted seeds of one pumpkin. Drizzle with olive oil and a pinch of sea salt flakes. Bake the seeds for about 20 minutes, stirring occasionally. Remove the sheet from the oven and add a selection of trail mix ingredients (mix up the ingredients if you like). Add 1/2 cup of coconut flakes, 1/3 cup of diced candied ginger, 1/2 cup of dried cranberries, and a generous sprinkle of powdered cardamom. Bake for another 12 minutes until toasted and fragrant, stirring occasionally to ensure the coconut flakes don't get burnt. Allow the trail mix to cool before packing it into jars or bags. 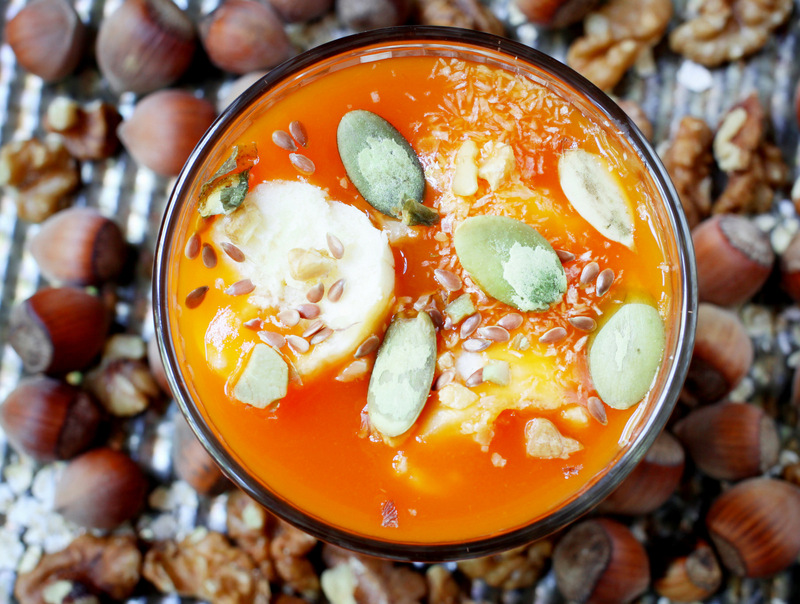 If you really want to use the whole pumpkin, there's no better way than eating a savory vegetarian soup made from fresh pumpkin, served in its own pumpkin shell, and topped with roasted seeds from the very same pumpkin. This fun presentation is perfect for a fall dinner party or celebration, and the pumpkin shell also serves as an impromptu table centerpiece - you could also place it on a platter surrounded by fresh biscuits and rosemary sprigs, or seasonal fruit like grapes and figs. 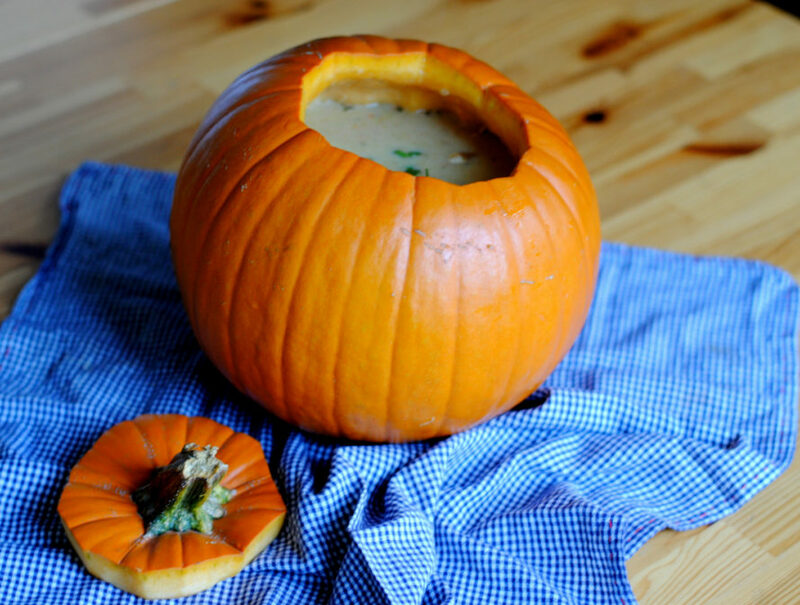 To make your pumpkin soup even tastier, roast the guts along with the flesh and puree it all together for a nutritionally dense dinner treat. Follow our complete tutorial here for details on everything from preparing the pumpkin shell to simmering a simple, savory soup to put inside. At the end of the meal, why not compost the pumpkin skin and shell to complete the cycle? Last but not least, what do you do with the bits of the pumpkin you really aren't going to use? Even if you make good use of the seeds, the flesh, and the guts, there are some bits that really aren't edible, such as the stems and the skin. If you toss your pumpkin skin in the trash, it will eventually end up at a landfill where the sheer amount of trash means it won't decompose properly, contributing to increased greenhouse gases and overfilled trash dumps. Composting the scraps with other organic matter speeds up the decomposition process instead, and well-made compost can be used again to grow and enrich new crops. What if you don't live in a rural area where you can make your own compost and use it in a garden? No problem - even urban dwellers can create a small compost bin in their kitchens. If you're worried about odor, follow our tutorial for creating an urban freezer compost bin. Once its full, you can drop it into a city compost bin or community garden, or arrange for pickup by an urban composting company.